Compact digital still camera with built-in flash, 3.3x Optical/4x Digital/13x Combined Zoom. My initial reaction is its is too bulky for me. For a point and shoot camera, A480 is still big compared to other models and obviously I prefer a much smaller one. Another turn off to me is the use of alkaline batteries. It is true that there are rechargeable alkaline batteries but I still prefer Lithium ions because Alkaline batteries are prone to leakage that might cause camera damage. Because of this, I might need to remove the batteries every time I don't use it which is a big hassle for me. Due to time constraints, I only tried the camera on some cityscape shots and toy photography. I like A480's Macro focusing range which makes it a good toy photography device. It also don't fail to catch good Cityscape shots even on a moving vehicle. But too bad, I don't like its performance on low light situations. I only have several days to use this device and I haven't tried all the features. It means, the learning curve for this device will take somebody who have an average knowledge on cameras at least a week to learn everything without reading the manual. Other than the bulky appearance and the low light limitations, A480 could be the right companion for hobbyists and travelers. Though with a price of $129.99, I would still look for other options. 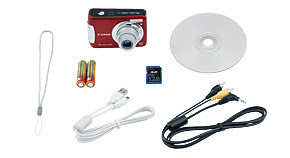 For more on Canon PowerShot A480 features and Specifications, visit this link.